It is now more than sixty years since radar began in Britain. In the intervening years, airborne radar has become one of the most important branches of civilian and military radar. 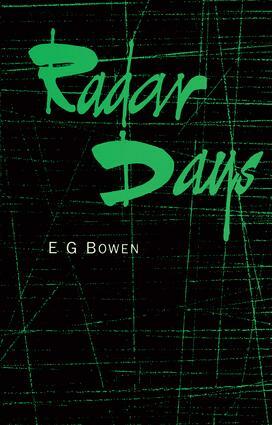 In Radar Days, "the father of airborne radar," Dr. "Taffy" Bowen recounts his personal story of how the first airborne radars were built and brought into use in the Royal Air Force, and of the Tizard mission to the USA in 1940, of which he was a member. Written from the point of view of the individuals who worked at the laboratory bench, the story begins with the building of the first ground air-warning radar at Orfordness in June 1935. The book proceeds to describe how this equipment was miniaturized to make it suitable for use in aircraft and the lengthy, sometimes hazardous flight trials conducted before radar went into service with the RAF. The author also details the activities of the Tizard mission, which was instrumental in installing the first airborne radars in US aircraft. The greatest achievement of the mission was to pass on the secret of the resonant magnetron to the US only a few months after its invention at Birmingham University. This was the device that brought about a revolution in Allied radar, putting it far ahead of the corresponding German technology for the remainder of the war. The beginning of radar in Britain: Orfordness. Bawdsey Manor. The early development of airborne radar: The first Ansons for airborne radar. Air-sea exercise in the North Sea - 4 and 5 September 1937. Sea search and some tales of 'D' Flight: Tales of 'D' Flight. Air-interception trials in Battles and Blenheims: Demonstration of air interception to the Commander-in-Chief of Fighter Command. Demonstration of air interception to Churchill and Professor Lindemann. Air-interception trials in the Blenheim aircraft. The outbreak of war and the move from Bawdsey: Dundee and Perth. The move to St Athan. The task at St Athan. The royal visit. Air to surface vessel radar against ships and submarines: First trials of air to surface vessel radar against a submarine. Battle of the Atlantic. Introduction of air-interception radar into service: Fighter interception unit. Introduction to the Beaufighter and ground control interception radar into night fighting. Centimetre-wave and air-interception radar. The Mosquito in intruder operations. The Mosquito against the V-1. The move from St Athan to Swanage: The transition from metre to centimetre waves: The Tizard mission to the USA and Canada: The Tizard mission in Washington. The resonant magnetron and Bell Laboratory: Formation of the radiation laboratory: Installation of the first airborne radar in the USA. Air to surface vessel mark II. Identification of friend from foe mark II. Air interception radar mark IV. Growth of the radiation laboratory. Project 1 - airborne radar. Project 2 - gun-laying radar - SCR 584. Project 3 long-range navigation (LORAN). Achievements of the Tizard mission in the USA. Postcript: Impact of radar on post-war activities. Appendices. Bibliography.